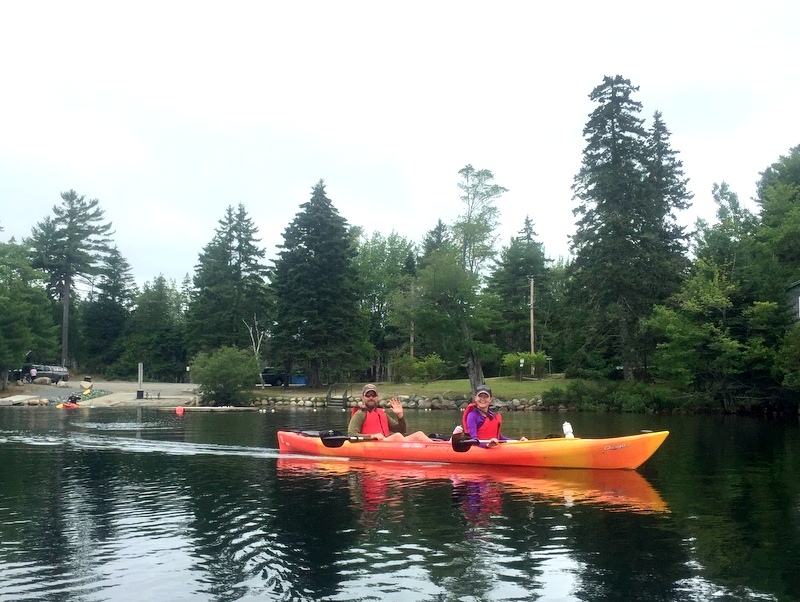 With Tim’s foot injury still not healed enough for hiking or long bike rides we’ve been amusing ourselves with more kayaking. Luckily we’re in an area full of lakes, bays and inlets. The weather over the past week has been following a typical New England pattern of sun – rain – sun – clouds – sun – fog (just make up your mind!) which has been a little limiting, but we did manage to get out for two fun paddles. 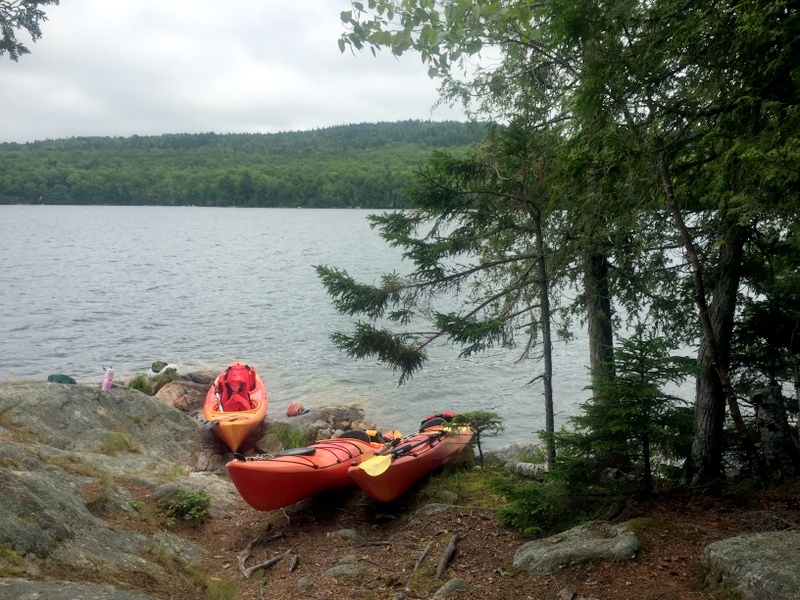 The first was on Long Pond with our friends Robin & Jeremy. They rented a tandem kayak from a place right next to the lake and off we went. 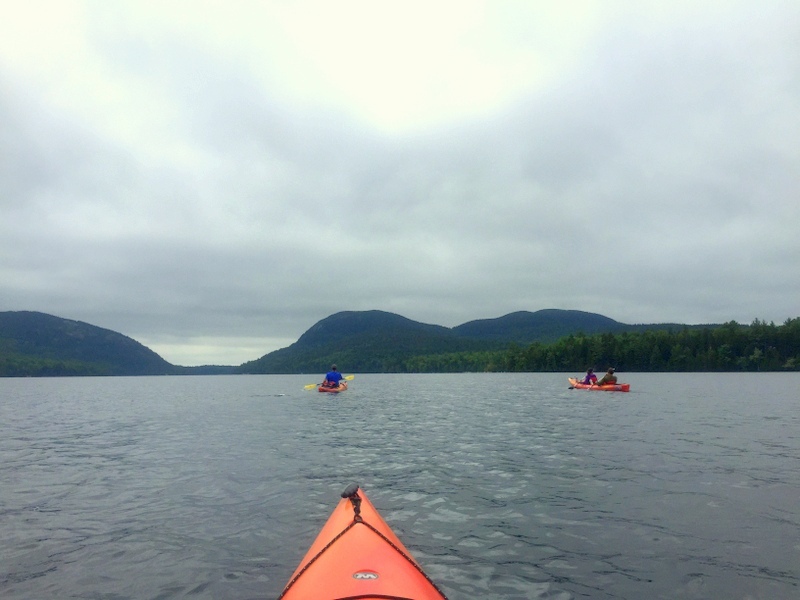 It was gray and cool out, but that didn’t stop us from paddling around for a few hours. Long Pond is located in the town of Mt. Desert on the quiet side of the island (in other words, NOT near Bar Harbor). The shores on the northern half of the lake are occupied by private homes, while the south end of the lake is inside the national park. We paddled a little more than halfway down the lake, found a spot to land for lunch, and then continued back on the other side of the lake. Despite the chill in the air the pond water was quite nice and Tim decided he wanted to swim a bit on the way back. So he attached his kayak to mine, and in the water he went. 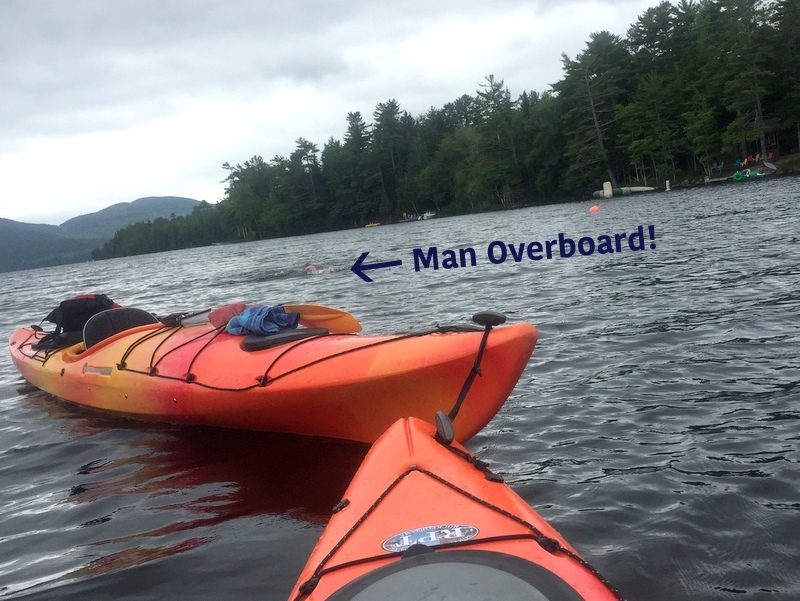 Towing his kayak was not a problem, but when he decided to rest and attached himself to my kayak things got a bit more difficult. 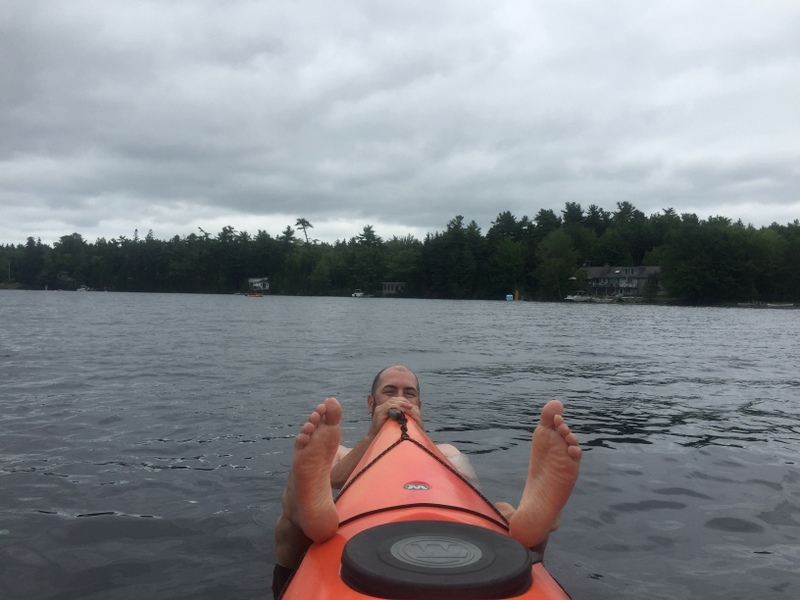 It was like having a giant human shaped barnacle on the front of my kayak. 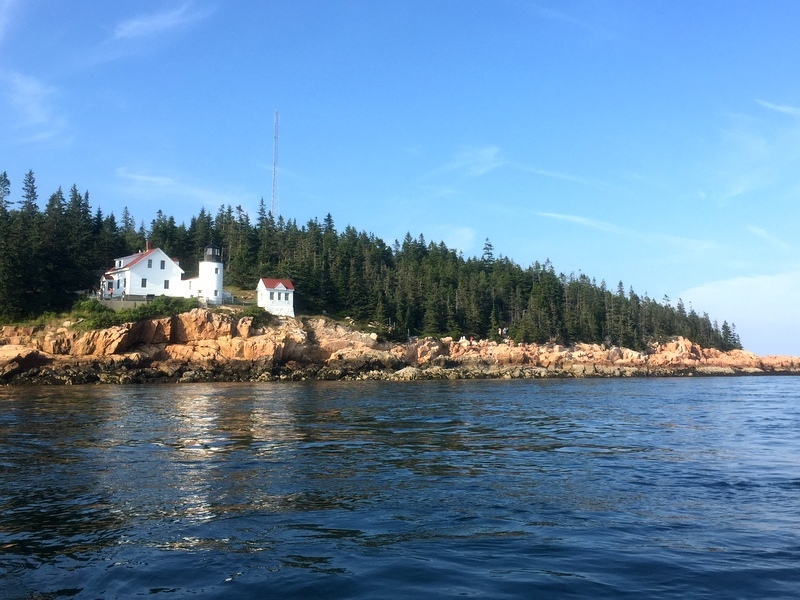 For our next kayaking adventure we drove down to Bass Harbor and paddled over to the Bass Harbor Head Lighthouse. There’s a great site called paddling.net that has a phone app with a map showing all the kayak launch sites around the country. It has proved to be very handy, and we found an easy place to put in the kayaks right in the harbor. 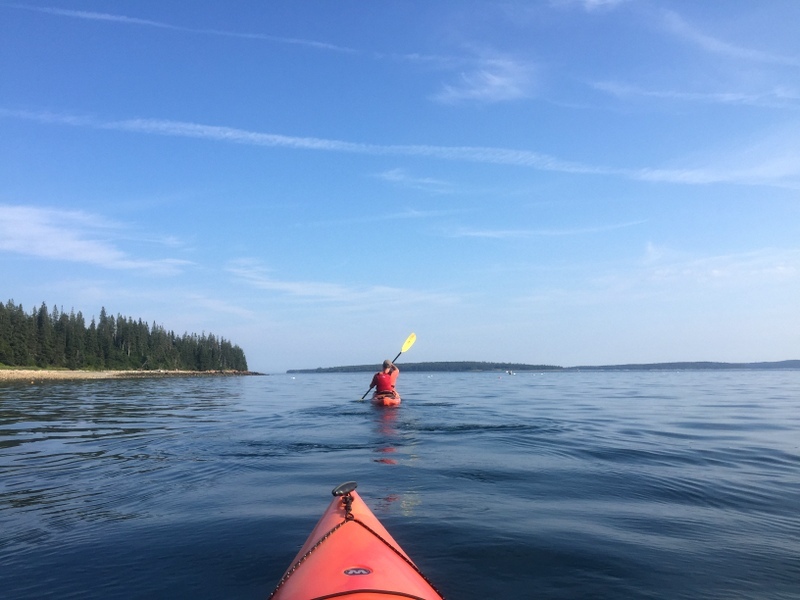 The water in the harbor was flat and calm making for an easy paddle out to the lighthouse. We rounded the corner and the lighthouse came into view. When you visit the lighthouse from land you have to climb down a rocky path and can only view it from the side. I think the water view was much better! The tide was on its way in and causing a pretty strong current in front of the lighthouse, so instead of going any farther we turned around and went back to the harbor to check out the anchored boats. 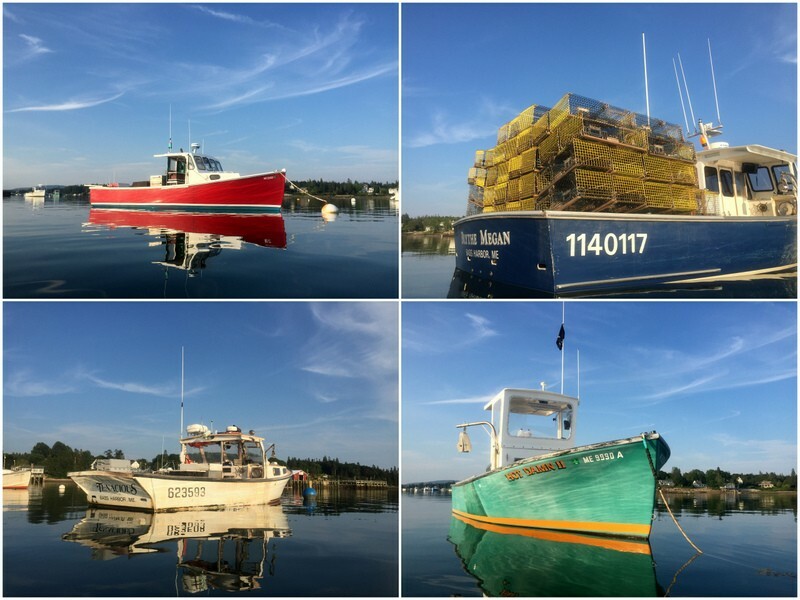 Bass Harbor is full of some really cool looking fishing boats. That’s it for our kayaking adventures in this area. Tomorrow we head south to meet up with some friends near Kennebunkport. From what I hear the campground where we’re staying has a river that flows into the ocean. Sounds like the perfect opportunity for more kayaking! I read that the bigger pond is sometimes called the “Great Long Pond to differentiate between the two. Still confusing though :) Happy travels to you! And then there is Long Pond in the Belgrade Lakes also in Maine, where we are now. Not too original those Mainers? 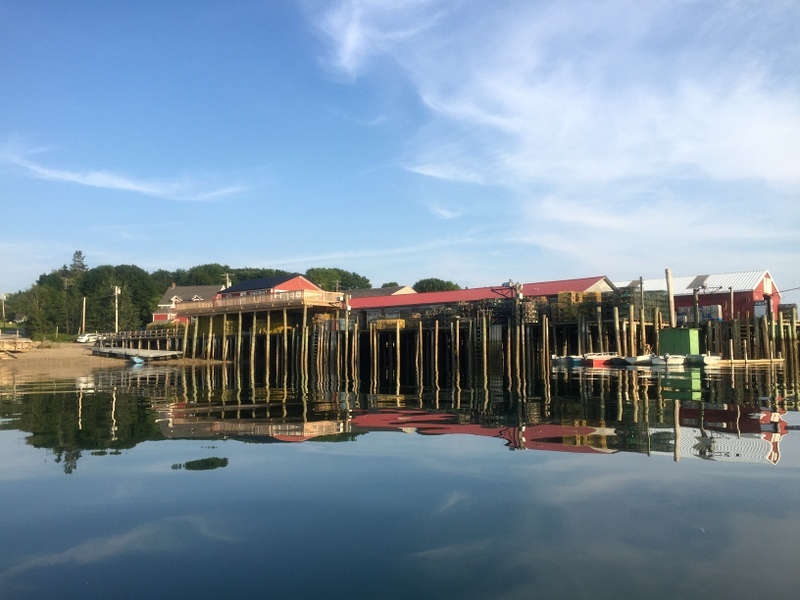 Those reflection shots at Bass Harbor are awesome! It’s great you still have a way to get out and have some fun even with the bad ankle! We were amazed by how clear and calm the water was in that harbor! If you plan on spending time near water I would highly recommend some kayaks. We’re having a blast with them! I have to admit, all these lovely kayaking posts are making it mighty tempting to get a kayak. Hope Tim’s foot is back to 100% soon! Ohhhh…you should do it. It’s so fun spending time on the water. You seem to be in the perfect location for kayaking! I think a hard-sided kayak is in our future. Yes, there are some great spots around here! So great that you’re getting out paddling so often. It’s nice to have options — we really like to mix up hiking/biking/paddling so that we’re not doing the same thing every day. Cool photos of the fishing boats! I agree. We are really enjoying the variety. Hoping to continue the trend of kayaking a few times a week! What a great decision to get kayaks. I so love the water. We are at a Corp campground that the water is a far drop from our trailer but I can see it. Get well Tim and keep having fun. After staying at so many campgrounds with water nearby (or in sight) it’s been great to actually get out and enjoy it! congratulations on your new kayak purchase. We just finished a great week with the RVaGoGO and Nealeys on Wheels. 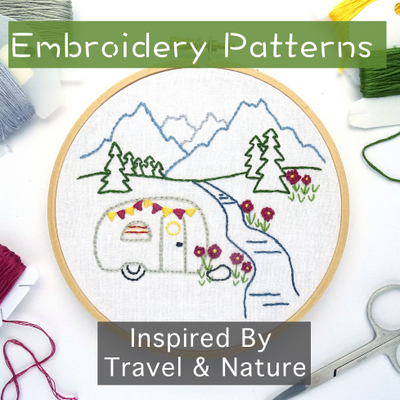 thought you might find this post useful for kayaking. safe travels!